Note the distinct white throat, blue-grey head and rich chestnut coloured wings. You can just see the white edging to the birds tail feathers. The female has a brown head but is otherwise similar to the male, the chestnut wings usually confirm the birds identity. A summer visitor to the UK, breeding in almost all of Europe and the UK. Considered a common bird in Europe, however numbers of UK breeding birds continue to fall. Thick dense bushes and scrub, particularly fond of Bramble thickets in the corner of fields which are surrounded by nettles. 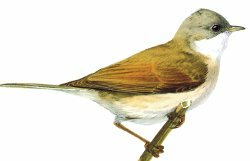 The male Whitethroat is well known for his loud vigorous song usually delivered from the top of a Bramble bush were he is easy to study. On bright days the white throat patch is the dominant feature, frequently puffed up as the bird sings. 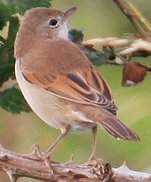 The female bird, seen less often, is recognised by her white throat and rich chestnut coloured wings. 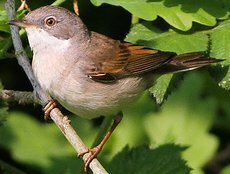 Numbers of Whitethroat are dwindling in the UK and it is thought this is due to increasing drought conditions in Sahel, South of the Sahara which holds Britains wintering birds.